As the temperatures continue to drop outside, winter sports begin to heat up! Activities, such as skiing and snowboarding, are very popular at all age levels and draw thousands of people to the slopes each year. Although, as health care professionals, we advocate for an active, healthy lifestyle for all, we want to ensure that everyone is active in the safest way possible as to prevent injuries. Winter sport injuries are dominantly traumatic and can be caused by falls, collisions, ski lift accidents and/or dangerous or rough terrain. Some of the most common injuries that are seen are injuries to the knee (ACL and Meniscus tears), injuries to the shoulder (subluxations, dislocations and AC joint sprains), injuries to the head (concussions) and fractures (wrist, hand, finger and ankle). Although some accidents cannot be prevented, below are some tips to minimize your risk of injury. If you are new to the world of skiing and snowboarding or haven’t hit the slopes in a while, sign up for lessons before heading out on your own. Most, if not all, ski resorts offer free lessons to new and even experienced skiers and snowboarders. Taking lessons will teach you about proper technique, how to fall safely, how to properly use the ski lifts, the “rules of the slopes” and which slopes are geared for your ability level. Let a professional instruct you correctly before you develop you own bad habits, which can place yourself, as well as those around you, in danger! Speak with a professional at a ski shop or sporting goods store when purchasing or renting ski and snowboard equipment. Although the temperature is cold outside your body temperature will slowly increase as you begin activity. Wearing several layers of light, loose-fitting, water and wind resistant clothing will help your body when adjusting to the temperature changes. Wearing appropriate protective equipment such as goggles and a helmet will aid in minimizing the extent of injury just in case an accident does happen. Before setting sail down the mountain, check the bindings to your skis and snowboard to ensure they are adjusted and set to your height, weight and experience level. Improper set up of you bindings or faulty bindings can lead to a dangerous fall due to lack of control of your equipment. Finally, never use old or outdated equipment without checking with a professional to ensure safety first. Check with your instructor or read the signage around the resort and abide by all safety rules of the slopes. 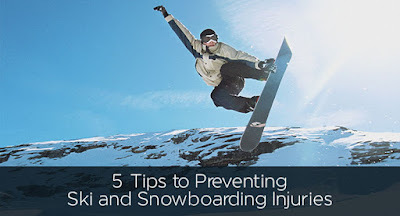 Learning how to yield, stop and safely fall meanwhile keeping your eyes and ears open for potential hazards when skiing down a busy mountain can prevent numerous injuries from occurring. When choosing a slope to head down, make sure the trail is marked, free of any rocks, trees and large icy patches and that the experience level matches that of your own. Being aware of your surroundings and learning how to navigate the slopes will not only keep you safe, but will also protect those around you. Beginning an activity without properly preparing the body sends thousands of people to the emergency room or their physician’s office every day. Just like we let our cars heat up on a cold, icy day our bodies need time to prepare for the stressors that we will be placing on it. Research has shown that “cold” muscles are more prone to injury. Warming up, or increasing blood flow to the body’s musculature, by completing a mixture of static and dynamic stretches and slightly elevating the heart rate by completing a short jog will greatly diminish the chances of a soft tissue injury (i.e. strains and sprains). Give your body all the tools it needs to withstand a long, tiring day on the slopes. Start your day off with a well –balanced breakfast of healthy proteins and carbohydrates to provide your body with the energy it needs to remain alert throughout the day. Dehydration can occur more quickly in the cold due to the amount of respiratory fluid loss through breathing, sweat quickly evaporating in the cold air and under the multiple layers of clothing and people don’t drink water as often due to not feeling as thirsty as they may feel in the heat. Remember to hydrate before, during and after the day as well as replace the calories lost through healthy snacking throughout the day. Skiing and snowboarding are great ways to remain active in the winter and are sports that can be enjoyed by all if done properly. Following the tips above and consulting with a professional if you have any questions or concerns, will hopefully lead to an injury free winter sport season!